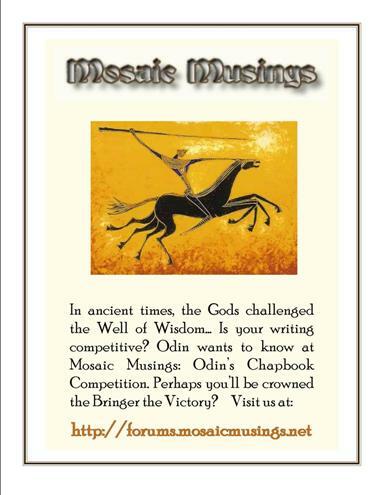 The winner of our tenth annual Mosaic Musings Holiday Classic has been chosen! A special goes out to our judges Bev (Peterpan), Karen (Anaisa), Snow (Eisa), Maureen and Carol Lynn. They were tasked with choosing 3 of the submissions they felt best represented the season, allocating 3 points for their top nod, two for second and one for third. The winning submission received 15 points awarded out of a possible 30, taking in 50% of the total; in other words, every judge chose it as their number one choice - FANTABULOUS results! Sylvia Evelyn, Bariloche, Argentine Patagonia. 2015. December inched laboriously towards the festivities, leaving a trail of fretful shoppers attempting to purchase that final, symbolic gift for somebody’s cousin just arrived from Chile; or perhaps for an odious personage they’d overlooked while writing Christmas lists... in Freudian slip mode. Meanwhile, the noonday Buenos Aires sun was wickedly transforming downtown asphalt streets lined with skyscrapers into veritable furnaces. Cynthia, on the other hand, sat through a suburban garage auction, feeling sweaty and doubtful. Indifferently, she dropped her little brown handbag on the ground by her chair. She wasn't at all sure why she was there. Waste of time. Lots of tatty articles being sold off at a pittance, perhaps for thrifty -or stingy- buyers seeking Christmas bargains. If it hadn't been for Jack's sister, for respect, companionship and all that, she'd have upped and left half-an-hour ago. Still, she sat there as if glued to her inflexible, plastic chair. I'm daft, she thought to herself; after all, Jack was my husband and now he's gone, why should I sit through this nonsense? Nobody even remembers me here. It doesn't matter one way or another what happens to that load of rubbish. Just odds and ends that Jack hadn't bothered to collect from his home, when Cynthia and he had married and gone off to live in Patagonia, so long ago. Family stuff, gilt-bound classic books, pictures, recipes, toys, candlesticks, silk scarves with damp stains on them... what the heck, he’d never had time to deal with all that. His sister should have thrown the lot out ages ago. The monotony of the auctioneer's voice, the oppressive afternoon, everything seemed to combine to make Cynthia nod off to sleep. She wasn't sure how long she'd been dozing, when she abruptly realized that a peculiar silence had fallen on the small crowd of people, twenty at the most. It was the silence that had awoken her, she was certain. She gaped in confusion up at the wobbly wooden stand where articles were being offered from a collapsing cardboard box. The auctioneer was holding up a water-colour of a glade encircled by trees and ferns, quite pretty, come to think of it... but suddenly Cynthia realized that there were two moss-covered mounds of earth nearly concealed in the woodsy scene. Her heart began to beat faster! She'd seen that scenario before, somewhere, many years ago... Yes! It had been Christmas Day, during that scintillating summer spent in Argentine Patagonia, in a log cabin they’d rented to get away from the strident city ambiance. Cynthia sprang up and ran to the stand. - Wait, wait! - she cried, - I must touch that picture, I must inspect it closer, please hand it to me! Below it, a signature: Jack's! - Hold on a minute! - Cynthia virtually yelped, - I'm sure you must have another water-colour in there, of a sun-dappled wooden bench beneath a leafy bower…yes… and creepers, flowering creepers over the window of a log cabin. The two pictures go together, they’re a pair, I must have them both! There was an air of suspense in the gathering of nameless people. They all seemed to know why Cynthia was so excited, so persistent. The auctioneer dipped into the cardboard box and eased out another water-colour, its frame chipped in several places. Cynthia gazed at it and, as if in a dream, two people seemed to materialize on the empty bench near a log cabin, arms around each other’s waists, heads close together over a book of poems. She and Jack! Then Cynthia saw only Jack beckoning to her from the sunlit bench, his lips inaudibly mouthing Christina Rosetti's poem, his eyes adoring her. She felt his longing, her own solitude... She glanced towards the other painting, saw the mounds of earth, yes, in the tranquil setting under the yielding trees, and all at once she knew... she knew it all: realization dawned on her as she remembered the glade, the comforting, cool earth, the carved wooden crosses. They had been put there by somebody, anonymously, barely visible in the overgrowth of wild foliage. She was certain, now, where she belonged. Resolutely, Cynthia stepped into the clearing in the woods, which embraced and soothed her, the fragile ferns encircling her body, the moss creeping over the twin graves, enveloping them…and her. She was home at last, with Jack. It was their Christmas reunion. The auction was over, though plenty of stuff remained unsold. People drifted away, clutching assorted articles. A boy stacked up the plastic chairs. He brushed fallen leaves off one of them, then spied a small brown handbag underneath it. Cynthia’s sister-in-law saw it simultaneously, reached to pick it up at the same time as the boy. She grabbed it first, and they looked askance around them. To her, it seemed familiar, yet she couldn’t remember it having been among her auction’s items. Oh well, she thought, the owner’s sure to return for it. Or not? -Yes, it was an exceptionally tragic event. Seeing those pictures brought it all back to me. I'm sorry Jack's water-colours had to be auctioned off. I understand he painted them for Cynthia. They both loved poetry. Try as she might, Cynthia’s sister-in-law couldn’t bring to mind the person who’d purchased the pictures. She vaguely recalled some sort of commotion, then quietude… as if a veil had been drawn across a time-gap intruding on that seamless, lethargic afternoon. The small, brown handbag was empty. It had a mouldy lining. She placed it on a stool in a corner of the garage. Next day there was only a light circle of feathery ferns in its place. WELL DONE SYL! HAPPY HOLIDAYS ALL THE YEAR THROUGH! Collaboration feeds innovation. In the spirit of workshopping, please revisit those threads you've critiqued to see if the author has incorporated your ideas, or requests further feedback from you. In addition, reciprocate with those who've responded to you in kind. Nominate a poem for the InterBoard Poetry Competition by taking into careful consideration those poems you feel would best represent Mosaic Musings. For details, click into the IBPC nomination forum. 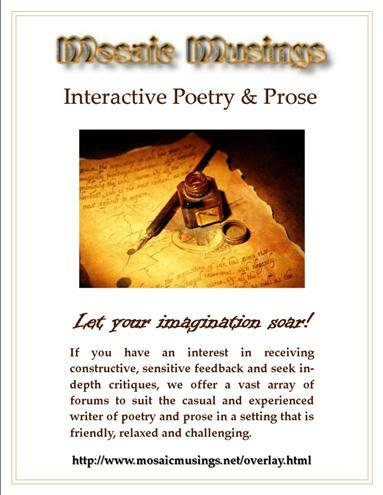 Did that poem just captivate you? Nominate it for the Faery award today! If perfection of form allured your muse, propose the Crown Jewels award. For more information, click here! "Worry looks around, Sorry looks back, Faith looks up." ~ Early detection can save your life. Oh my, Lori, I was absent from MM over the weekend, so I just saw this now when I finally checked my e.mail. 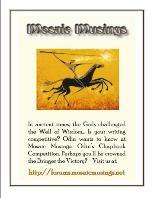 Never expected my story to win the Mosaic Musings Holiday Classic. One reason being that it would seem strange to others to read about a stiffling hot Christmas, instead of the traditional snowy weather in the Northern Hemisphere. We have no snowmen or reeindeer over here! Not even in Patagonia...today we had a high of 30ºC with a blazing blue sky! So thank you all...I really don't know what to say, but I realize the judges worked hard on the entries and Lori had to sort out the results on a spreadsheet to figure it all out. I feel surprised and pleased! Many thanks, as well as congratulations to all those who participated in MM's yearly event. Sylvia Plath, Crossing the Water, Wuthering Heights. This caught my eye as I was scrolling around here. I'm very pleased that you took top marks with a prose contribution, and perhaps that is because I have always liked Dylan Thomas's Christmas in Wales. I'll also confess that I didn't read any contributions, likely because I submitted one right before the deadline. That said, I make no conclusions regarding others, leaving it up to the judges' best consideration. I can see where your warm-weather one should top them all. At the moment, my snow is melting rapidly. Here in the high country we were not spared at all, accumulations amounted to some 90 cm or so. It's now moist and very heavy. Birds have returned, so I'm thinking leaves are beginning to turn in Patagonia. Our planet is tilting the other way again. A gripping story with a surprise ending. Well written! 1st place is very well deserved. Let's hear more from you. Live one day at a time -it's simpler that way. Laugh loud & often - it's medicinal. Write from the heart - it's therapeutic. Beauty comes from within - the outer is just skin! Nominate a poem for the InterBoard Poetry Competition by taking into careful consideration those poems you feel would best represent Mosaic Musings. For details, click into the IBPC nomination forum. Did that poem just captivate you? Nominate it for the Faery award today! If perfection of form allured your muse, propose the Crown Jewels award. For more details, click here! Thank you, Merlin, for scrolling around here and leaving your kind words. Perhaps you're right, a warm Christmas must sound attractive after all the snowstorms that have hit the USA this winter. I read about the emergency call in New York...and that about 20 people died because they didn't stay in their homes. So sad. And now I'll look up Dylan Thomas's Christmas in Wales. Tx for the tip! BTW, some of the judges are not members of MM, so they don't know me, nor I them. Hope they join us! What a lot of snow you had, Eric. You must be happy to see the birds returning. Sounds a bit early to me. Sign of a long summer ahead? Hope Earth doesn't tilt too far! We're still in midsummer in Patagonia. March 21st. is the official start of Autumn. We get nice cool nights, but very short ones. Our winters appear to be getting milder. The skiing season was OK, because the slopes are high up on our pre-cordillera (lower Andes). But we only had two short snowfalls where I live. It was fun. My daughter put on her skis and went off on them to do our shopping. She lives in a house just beside me. Our neighbourhood has few houses and people were busy shovelling and trying to start up their cars. Diana thought differently, didn't wait for the muddy aftermath! All the best to you, Eric. Hey, Lori has posted the results in several places! Thanks again, Eisa, for your encouraging words. I think I have some stories filed away that I never posted anywhere. Must do. May the angels guide your light. Thank you, Bev, for your kind words. I'm glad you enjoyed the read. But I would be more pleased if you were to continue writing poetry here at MM. Your views from South Africa always add a touch of distinction, ideas we may not know about, seldom read in newspapers. Such impressive landscapes as well as lovely myths. BTW, do you know about S. Africa's famous Nr. 9 rugby player who has contracted MND (ALS)? I was sent a DVD about his life, from a friend in Britain. So sad...my son Patrick had MND, died aged 29. But Joost is fighting hard and has dedicated part of his time to his own MND Association in S. Africa. I'll find a link to Utube where you or anybody else who is interested can listen to a lovely song at the end of the doc. I'll post it here. BIG hugs to you, Bev!!! PS: Do you see or get news from Wally? We miss him too. I am trying to get my head in the poetry groove. I think I know, what and how I used to write. I must get back into that habit...I used to make short notes all the time. Hand written ones. Observations etc. It always translated into a poem or a story or a drawing or painting. Hope you have a good weekend. We may do a short trip to Durban, one and a half hours away, we will stay with a friend, go to movies or a show, do some shopping, have dinner and come back on Sunday...we live in sleepy hollow here. But, very happy with it! There's a lot of investigation going on concerning the amount of rugby players that die of ALS. It used to be said that it was the pesticides used on the fields. Nowadays they're studying other games in which hard knocks on the head also seem to be a suspicious factor. Boxing, football, etc. And these factors can produce other sorts of neurological damage, which may not appear for some years. Even mental (psychiatric) disorders. Fact is, any blows to the head, accidental or otherwise, are under investigation. So the joke about "being dropped on your head as a child" is not so funny anymore. My son Patrick, while bycicling, was shoved over by a car and received a bad knock on the pavement. He managed to say where he lived and the driver brought him home, was extremely agitated and apologetic. He had Patrick's bycicle made good as new. Meanwhile, I helped Patrick on to the sofa and called the hospital. They said to bring him in, so I did. On the way, to my dismay, he began to hallucinate and have visions...At the hospital they wheeled him off for brain scans and other tests. Nothing bad showed up, but of course they kept him overnight, under observation. In those days, we were not allowed to accompany anybody interned overnight. Crazy! The nurse told me to go home and get some rest, but I was back at the hospital at dawn. I was told that a nice nurse chatted with him as much as possible during the night, something about that it was better not to allow him to fall asleep...I could have done that willingly! Patrick was very pleased to see me, I stayed until the doctor said he could go home. He was back to normal, no more hallucinations. Some nasty bruises and a cut over one eye, which they'd stitched up. Well, he was 17 then, and by 24 he began to show signs of neurological problems, dropping things and his voice hoarse. Well, he had ALS. It was all so shocking, we'd never heard of the disease before. The doctor told him straight to his face that his life prognosis was only a year, since he'd gotten the worst sort, called Progressive Bulbar Sclerosis. But I cared for him, with assistance, he had a gentle exercise routine, I adjusted his nutritional needs, and he lived till 29 years old. His girlfriend abandoned him, which is common in these cases. He was cheerful most of the time and got his university degree, working from home on a special computer. That made him very proud! He celebrated with his pals. Only during the last month of his life he sat in his wheelchair, losing interest in most things. He passed away in his sleep, no need for hospitalisation. He'd indicated that he didn't want any mechanical assistance for breathing, but it wasn't necessary anyway. I'll look up the book you've read. I do lots of reading, at present I'm reading a book by an Iranian female author, translated into Spanish. In English the title is "The Blood of Flowers", author Anita Amirrezvani. It's about Iran before all the wars and bombing began. Although it's a novel, the author did 9 years of research into 17th., 18th. Century Iran. She doesn't live in Iran, but travelled many times to investigate. I've lent it around and everybody marvels over it. 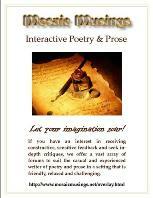 Do get your scraps of paper together and see what marvellous poems you can create with them. I always carry paper around with me to scribble on.